Turkey will chair the Shanghai Cooperation Organization (SCO) Energy Club in 2017, being the first non-SCO country to do so. The nomination came after officials from Russia and China gave a green light to Ankara after President Recep Tayyip Erdoğan on Sunday pointed to the Shanghai Cooperation Organization (SCO) as Turkey's alternative to the European Union. 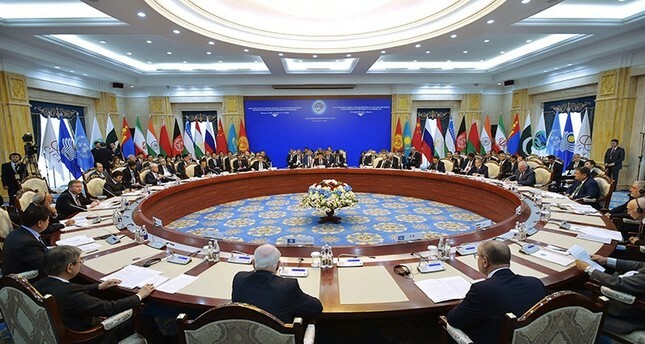 In addition to SCO's original members, Turkey, Afghanistan, Iran, Mongolia, Belarus and Sri Lanka are members of the SCO Energy Club. Energy Ministry officials told Anadolu Agency that Turkey's proposal to member states of the SCO, which was that all countries of SCO partnership status should take turns in presiding the Energy Club for a year, was accepted and Turkey was unanimously elected to chair the Energy Club in 2017. The SCO Energy Club brings together some of the world largest energy producers, namely Russia, Iran, Kazakhstan and Uzbekistan, with the world's largest energy consumers, China and India, in the same body. The SCO Energy Club aims to deepen energy cooperation among member states, in addition to bolstering energy security and updating energy strategies. The members of SCO cover some 36 percent of the world's electricity, 23 percent of natural gas, 20.8 percent of crude oil and 60.2 percent of coal production. They also consume some 28 percent of natural gas, 25.2 percent of crude oil and 65.1 percent of coal. The Shanghai Cooperation Organization was formed by China, Russia, Kazakhstan, Kyrgyzstan and Tajikistan in 1996 under the name "Shanghai Five." After the inclusion of Uzbekistan in 2001, the members renamed the organization. Mongolia, India, Iran, Pakistan and Afghanistan are observers of the SCO, while Belarus, like Turkey, is a dialogue partner.